Artificial intelligence powered speech-to-text tool Trint is having a moment. Since winning the Startups for News competition at the GEN Summit in Vienna in 2016, Trint has very rapidly become ubiquitous, with a cult following of journalists and users praising the tool as a game-changer. We talked to co-founder and CEO Jeff Kofman about his successful startup, and got to discuss what participants can expect from Trint at the GEN Summit in Vienna 21–23 June, where he will be a master of ceremony and where an exclusive new functionality will be unveiled. GEN: Trint won the Startups for News competition in June 2016 at the GEN Summit, after competing against 100 startups pitching their tool What has happened for Trint since the launch in autumn 2016? Jeff Kofman: We spent 21 months developing Trint. We started in December 2014 as a team of four. We went through three complete revisions of the product based on prototype, testing, user feedback. We were trying to get it to work on a simple intuitive level, that would make it very easy, so users wouldn’t need to go to the Help section: they would just be able to start the moment they arrived on our page. That was our goal. We felt we got there by the summer of 2016, a few weeks after winning Startups for News in Vienna. We had been in a closed, paid beta version through the summer, testing our payment systems and testing the product. We launched the product on 5 September 2016 and we have seen phenomenal growth since. 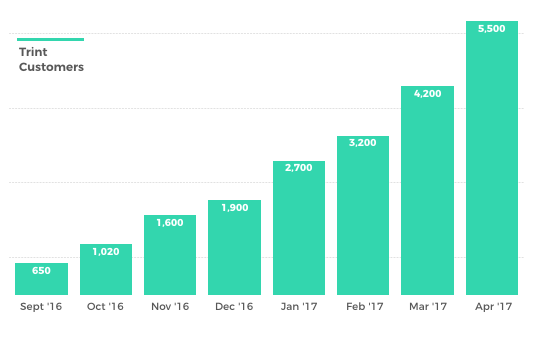 We have seen double digit growth in revenue and usage every month. We now have thousands of people using the tool every month. It is very exciting to watch it grow before our eyes. We have also been getting more positive media coverage and social media feedback too. And as we rise up in the Google search ranks through organic searching, everything is just moving ahead even faster. Journalists have to transcribe the contents of interviews, speeches and news conferences before they can write a news story, a documentary, a blog or whatever they are doing in the digital age. It is inevitable. Wired magazine called us nothing short of ‘amazing’ recently. This is really exciting that people are taking to Trint in the way we hoped they would, taking a sense of ownership about the product. We invented the word hoping people would use it as a verb and a noun. And that’s exactly what they are doing. I think that what I’ve learned as a journalist who has become an inventor and entrepreneur is that the most important inventions are the ones that solve problems. Trint solves a real problem. I know that because I spent 30 years as a journalist transcribing my own interviews, speeches, news conferences and I always hated that process. I believe that you need to listen to your interviews to be a good writer. But I don’t think this means you need to be a stenographer sitting in a dark room with headphones on for two days transcribing your interviews. Journalists have to transcribe the contents of interviews, speeches and news conferences before they can write a news story, a documentary, a blog or whatever they are doing in the digital age. It is inevitable. And it is a bottleneck in the workflow because they are under huge pressure to turn it around quickly. This is the very issue I had that we are trying to solve. Trint, and yourself, will play a very important part during the GEN Summit, what can we expect from Trint? The GEN Summit is a really important event for Trint. It will be a real milestone. We are unveiling our first added value product: the Trint player. Until now the content of a recorded interview, speech, or news conference sitting on the Internet has not been searchable. Journalists or users can go to a news organisation’s website to listen to the audio, but if it’s a long speech and they want to find a specific reference, they would just have to listen to it. That is where the Trint player comes in: a product that will allow users to quickly make the content of a recorded audio or video searchable on a website to consumers and to internal users. People will then be able to share it on social media. We plan on introducing the new tool to the audience by ‘Trinting’ some of the key sessions at the Summit and then publishing them, within an hour or two, to the GEN Summit website. When a participant sitting in the audience hears a speaker say something of interest that they would like to tweet and share with their colleagues at the newsroom, he or she will be able to go to the GEN Summit website, find the excerpt and reference, highlight it and put it on social media in seconds. The Trint transcript will be attached to the Youtube video and, just like karaoke, the user will be able to follow the text and the audio, find the moment and share it. We really think this represents a revolution in the way people will be able to access that content. Remember more than 80 percent of the content of the Internet is recorded talk, it is audio or video recording, and it is not searchable. Trint is going to change that and everyone will see it the very first time at the GEN Summit. Trint as a startup has become quite the success story, but it is notoriously hard for startups looking to work with publications to just get a foot in the door. How did it happen for Trint ?How did it work? It is a combination of things. It is true that newsrooms are both hungry for technology, but also very cautious about technology. Budgets are limited, resources are limited. A lot of technology promises and doesn’t deliver. There is a reason to be skeptical. We have been able to gain a really strong market-hold at a very rapid pace for a number of reasons. The first one is simply that the technology works, which is the most important thing. We solve a problem. People understand that transcription is a pain, it is expensive, it is time consuming. It is one of those things that anyone who has done it wishes it wasn’t necessary. So people are hungry for solutions, there is an openness to trying something new. Budgets are limited, resources are limited. A lot of technology promises and doesn’t deliver. The second reason is because of our initial business model: we started by giving a free trial and then on-going access for very little money. We have consistently seen bottom-up penetration of news organisations in the sense that one reporter tried it, told her colleague who tried it and then suddenly we have five people in a newsroom using our tool. A managing editor was then easily convinced to adopt Trint. It is that sort of low hanging fruit concept of getting access to markets. And it has been very effective for us, because the issue is that building an enterprise system can take you a year, and then another year needs to be added to get newsrooms to sign contracts and take on your product. It is not a viable option for startups: they would be bankrupt by then. So for us we’ve had the good fortune of having a software service that individuals can adopt, validate and then it can work up the tree, into an entire news organisation. That is what has been happening. Now we are focused on building an enterprise product. What is ahead for Trint now? 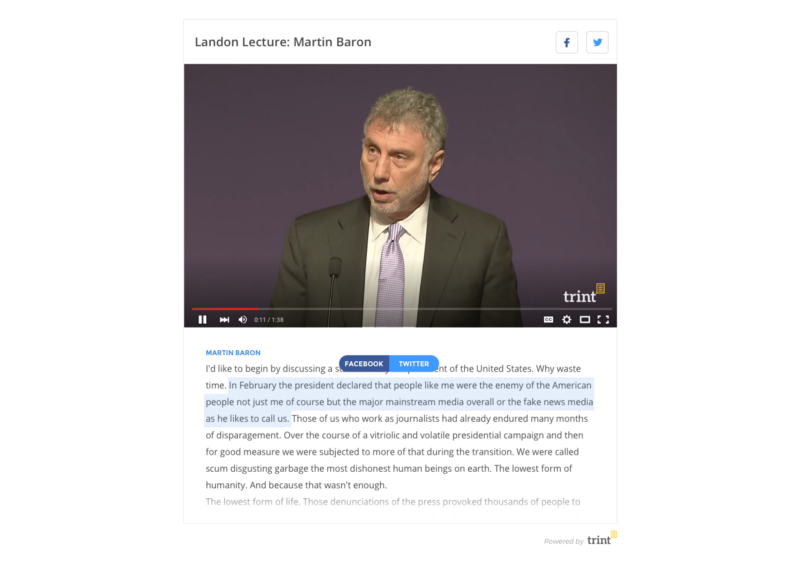 The current version of Trint is a workflow tool that uses artificial intelligence to transcribe and an editor to allow users to search through their your content quickly and verify it. If the AI has made a mistake, users can quickly correct it, expediting the transcribing process. This is just the beginning for us. What we are building now is the next phase of Trint: an end-to-end publishing tool for the users can quickly get their content out, tweet it, put it on Facebook, add captions to it or embed it so that is is searchable on their website. This is where we are going. There are tools and innovations that I cannot go into for competitive reasons, but let me just say that our roadmap contains things that are just extraordinary. We have just concluded a very successful funding round of several million pounds, so we are doubling our team – we’ve just hired two people in the last week. And we will be hiring 10 more people. We will be a team of about 20 to 25 by the end of summer, because we want to really ‘rapid-fire’ the innovation into the system and at the same time build out a full enterprise product. We know that we cannot grow within news organisations and other organisations unless we make these things a priority. Startups for News is an international competition that rewards early-stage startups working on high-impact and daring solutions for the news industry. Every year, the Global Editors Network (GEN) in partnership with journalism.co.uk and this year, Slush and Media Lab Bayern, selects the best startups that address newsroom challenges through dynamic and innovative products or services.